Caught in the Middle is one of the best books of recent times. Mike Procter was one of the most efficient all-rounders of all times. He finished with a Test bowling average of 15.02, strike rate of 36.9 and economy rate of 2.44 while claiming 41 wickets in seven Tests. He even managed 21,936 runs (ave.36.01), including 48 hundreds and 109 fifties in first-class cricket apart from capturing 1417 wickets at 19.53 runs apiece in 401 matches. Also held 325 catches. While in the autumn of his career, Procter, the match referee, was caught in the middle of the Darrell Hair chronicles, Monkeygate in Australia, and the bomb blast that ended international cricket in Pakistan. 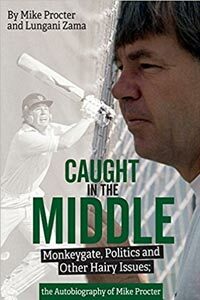 A compelling read, Caught in the Middle is the fascinating story of a lifelong love affair with cricket. In this outstanding publication, Mike Procter shares unmissable memories of his career and life in cricket, including The 1971 walk-off of at Newlands, in protest of the Apartheid government refusing to endorse a multi-racial touring party; being a dressing-room attendant for the mighty West Indies in his teens, which sparked an enduring friendship between the game's greatest all-rounders; appearing as an overseas pro in County cricket in the 1970s - and ruining a good suit with an impromptu game of rugby; a surprising invitation to dinner at John Arlott's house; a brush with the law involving human trafficking from Rhodesia to Europe; being relieved of his South African coaching duties whilst in an intensive care unit and sharing the commentary box with Bill Lawry for that 1999 World Cup semi-final. In his foreword, Mark Nicholas has paid a rich tribute to Mike Procter: "He scored six consecutive hundreds in the Currie Cup, bowled the speed of light when the mood took him, swung the ball a mile, ripped his off-breaks and held most catches that came his way. He played the game in a buccaneering style, entertaining crowds and terrifying opponents. When the day was done, foe became friend and the night was young. Only a few have carried this off. Legend has it that Keith Miller played with the gods in sunlight and after dark, Sir Garry Sobers too. Another cricketing knight, Sir Ian Botham was of similar stock. Well, put Proc on the list too and if you think that an exaggeration, ask anyone around at the time." John Saunders, the man Mike Procter calls 'the best coach I ever had', says in the introductory chapter: Mike's cricketing talent and his combativeness undoubtedly owed much to Woodrow, his father, his serene, generous and cheery temperament probably owed much to his mother. After retiring from first-class cricket, Mike continued to make a contribution as a coach and international umpire. In his writings and in interviews he has been surprisingly lacking in bitterness. When asked what he felt about the politics which had removed South Africa from the world stage and forced him to become something of a 'cricketing buccaneer', he replied: "What is a Test career compared to the suffering of 40 million people? Lots of people lost a great deal more in those years, and if by missing out on a Test career we played a part in changing an unjust system, then that is fine by me." Both John Saunders and Mark Nicholas have no doubt about his extraordinary talent and the legacy that he has left behind. Mike Procter's illuminating first-class career statistics from 1965 to 1981 apart from his Test record, have been meticulously compiled.